This project will validate the accuracy of the pavement condition predictions and provide confidence in the MDSS recommendations. This research will build upon the system developed under Aurora Project 2004-04. If this system can be expanded in use by other non-Aurora agencies, the team can determine if revisiting the index is necessary. Noting that there are several indices out there and some new ones that might help the ‘individual storm’ component, this may be a technology transfer issue. The existing index was not designed to help the problem of quantifying individual storms. This project will identify efficiencies gained, impacts on road condition, costs, cost avoidance, and document the model for other agencies to follow. This research will compile the best practices on how road weather information is being transferred to stakeholders. In addition, it is important to identify the best method(s) for notifying the public/media and operations staff of current RWIS data. It is not clear how much information is needed to inform the public and government officials of “current” operations during a storm. 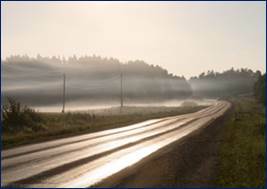 This project would ultimately identify the optimum methods for communicating road weather information to this diverse stakeholder base can maximize the benefits of the road weather program. The objective of this research is to validate the predicted thaw depths and restriction dates recommended using the Clarus EICM approach and alternative, degree-day based approaches to provide an understanding of reliability of different approaches in setting load restriction dates. Weather information systems are important all year round in maintaining safe travel conditions for freeways and roadways. Nevada has realized the overwhelming importance of road weather information and has worked with Aurora since 2008 in hopes of gaining some valuable knowledge to improve their RWIS and Road Weather Information Programs. “We felt like it would be a tremendous learning experience to join a group of RWIS and Road Weather experts, such as the Aurora Pooled Fund Group” says Bill Hoffman of the Nevada DOT. So far, Nevada DOT has learned a great deal about RWIS Operations and Maintenance Procedures through its partnership with Aurora and the knowledge they have gained through this has helped them develop an effective RWIS Program. Bill Hoffman says, “The benefits from joining this group are numerous”. Nevada continues to look to Aurora for advice and guidance in their RWIS programs as well as working with neighboring states in creating and maintaining winter maintenance data sharing and linking their operations across state lines.